This post originally appeared on Pinstripe Alley. Read the original here. As everyone knows Derek Jeter, aka “The Captain,” retired after this past season. The Yankees replaced him by swinging a three team deal with the Diamondbacks and Tigers which netted them young Shortstop Didi Gregorius, which has been a pretty polarizing move. I know Didi is no prime Derek Jeter – something last year’s Derek Jeter couldn’t even sniff either – but it’s not like he’s bound to be the most useless Shortstop in team history either. That brings me to today’s Forgotten Yankee, Spike Owen . You might not like the Gregorius deal, and you might still be pining for your Captain, but just remember that it could be a lot worse. Famous last words? That was Owen in February of 1993. He had just reported to Spring Training after signing a three year, $7 Million deal to be the new Yankees Shortstop. Nowadays, you wouldn’t expect much from a player getting paid an average of $2.3 Million a year (it’s essentially the same contract Brendan Ryan is currently under). Back then, while this contract wasn’t good enough to be considered a top deal, it was a pretty significant deal. The first year of the contract would pay him $2.25 Million, which was good enough to be in the top 25% of major leaguers (165th overall). The salary dropped to $1.25 Million the second year, which was reasonable, but ballooned to $3.25 Million in year three, which ended up putting Owen in the top 100 in Major League Baseball (97th). Spike Owen! Unfortunately for the Yankees, Owen ended up playing like the part time role player that $2.5 Million would get you nowadays, and he would not see the end of the contract in the Bronx. So why did the Yankees even sign this guy in the first place? There must have been a lot of talent there at some point, right? Owen played college ball at The University of Texas at Austin and was eventually drafted with the sixth overall pick by the Mariners. Boy, was baseball different in 1982 or what? After four no hit, all glove seasons with Seattle, he was traded with Dave Henderson to the Red Sox for Rey Quinones and some players to be named later. This was actually a great deal for the Sox, as they ended up making it to the World Series the following year. The Sox eventually traded Owen to the Expos, where he was the starting Shortstop for three years before the Yankees made the terrible decision to pick him up. 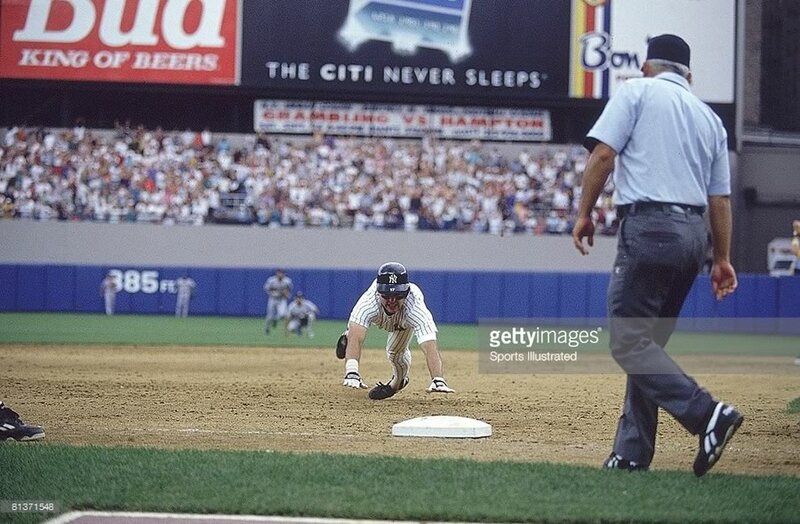 In defense of the Yankees, Owen was coming off of a very good season – especially by middle infielder standards of the late 80s and early 90s – with the Expos. He had hit .269/.348/.381 with a career high 7 home runs. He was also viewed as a good defender, and the team was hoping he would stabilize a position that had been, for a long time, a complete cesspool. Listen to this list and try not to jab a pencil in your eye: Bobby Meacham, Wayne Tolleson, Rafael Santana, Randy Velarde (pre-PEDs), the great (by which I mean terrible) Alvaro Espinoza and Andy Stankiewicz. Now, don’t get me wrong, Stanky and Espy (Girardi naming conventions) were two of my favorite players, but that was because I was under the age of 10. Like most kids that age, even those that end up at genius level, I was an idiot, just trying to feel my way through the day without getting my head stuck in a banister or something. I probably just liked them because one was tiny, and the other had glasses and a mustache like my dad. Anyway, the Spike Owen experiment ended there for the Yankees. He went on to play two years with the Angels – some of that on the Yankees’ dime – even hitting .310 as a part time player in 1995, but was out of the majors after the 1996 season. The Yankees, meanwhile, had a pretty good looking prospect in the minors they were looking to groom for the future. He was tall, well built and had quite a bit of pop in his bat…You guessed it, Dave Silvestri. Is everyone more appreciative of the Derek Jeter era yet? I wanted to tell this story because, for the last 20 years, we had no idea what it was like to not have a dependable Shortstop on the Yankees. The decade before that, and even longer really, things were very bleak in the Yankees middle infield. Could we be headed to another dark period in Yankees Shortstop history? We certainly could be. Personally, I think Gregorius will be fine, as long as his defensive abilities are not as exaggerated as Owen’s. Here’s hoping he isn’t another Spike Owen style flop. Uruguayan born and American raised with a unique perspective on the domestic and international sports scenes. It will both tickle your funny bone and enlighten your mind. Love it or hate it...just read it.